I tend to be a bit of a planner. With the month of August coming to a close, in my plan-ahead mind, Christmas gifts are the only logical action to begin contemplating. My mind has been buzzing about the perfect gift(s), while cleaning the chicken coop sweating in 100º degree Florida heat. Out of place? But, hey I’m a planner. Meaning and uniqueness: I love gifts that have meaning and are unique. The kind that make you go, “Wow! That person really put thought into this!” Those are the kind of gifts I love to give and receive. Ones that bring on the warm fuzzy feelings. Budget-friendly: We are a one income family. Stay-at-home-moms just don’t make wages paid in green and gold, at least, not the money kind of green and gold. While I love unique, I must also strive for affordable. Last week my local food co-op (I really love my co-op), placed a very large vanilla bean order. An email went out that a surplus of vanilla beans existed and so like any impulsive, planner does, I claimed ninety! Each bean only cost around $.75. A killer deal for vanilla beans. Of course, I bought ninety. Being the planner I am, a huge bag of ninety vanilla beans got me thinking about the perfect Christmas gift. With my arsenal of vanilla beans, a trip to the liquor store for a couple of large bottles of vodka (I had to seriously convince the lady I didn’t have a problem, “Okay, crazy vodka-buying lady, whatever you say”), and a few cute bottles from a craft store, I spent my weekend prepping for Christmas, making homemade vanilla extract. Up until this year I’ve always purchased vanilla extract from the store, but when you bake from scratch, a lot of vanilla is used and genuine vanilla extract gets pricey. One shopping trip, I had a light bulb moment (I must have been childless) and flipped over a bottle out of curiosity. The ingredients were simple: vanilla beans and alcohol. I was paying $12 for a small 6 oz. 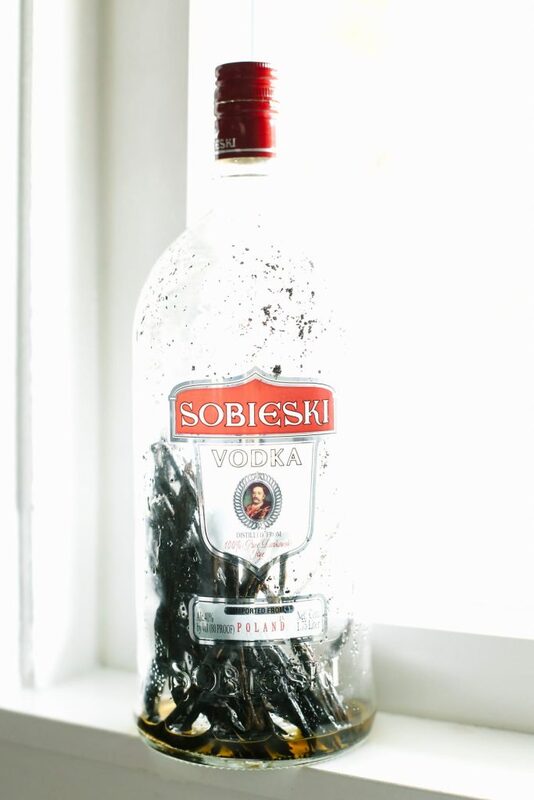 bottle of alcohol and vanilla beans. Since that light bulb moment, I’ve been making my own. The inexpensive cost, small amount of time, and fabulous taste that comes from making my own vanilla has convinced me to never go back to those pricey little bottles on store shelves. This year, my family (if you are reading this please act excited at Christmas), will be joining in this small little piece of kitchen luxury called homemade vanilla extract. Homemade vanilla extract for all. 2. Start with long, fragrant vanilla beans. You will need 3-4 vanilla beans per 8 oz. of vodka. 3. Slice your vanilla beans in half, lengthwise. You’ll find tiny specks inside. These are the actual vanilla beans. They are what you use to make delicious treats such as this ice cream. For vanilla extract, you want to keep the tiny beans inside the pod. No need to remove them. 4. 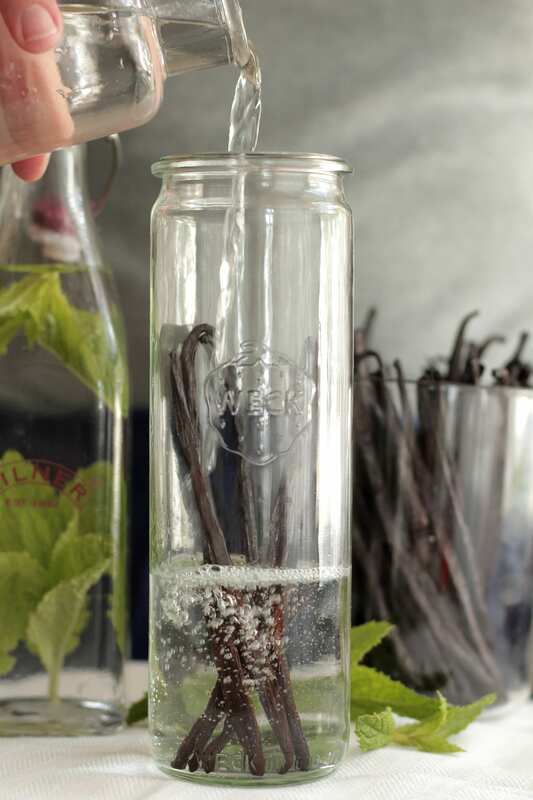 Place your long, sliced vanilla beans inside each bottle. Find bottles here. 5. Now, it’s vodka time. 6. Pour the vodka in each bottle. You want the vanilla beans submerged in the vodka. 7. Place the cap on each bottle and allow to sit in a cool, dark place for 3-6 months. The only work required is a weekly gentle shake. The beans will infuse the vodka over this time. Planning for Christmas in August doesn’t sound so crazy anymore. There is always a method to my madness. At least I like to think so. 8. 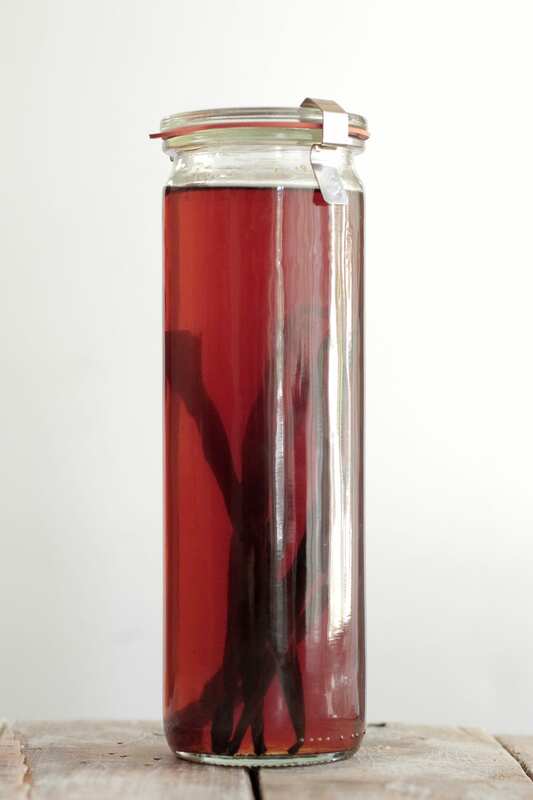 After 3-6 months your vodka and beans will resemble vanilla extract ready to be used in any homemade treat or be gifted as the perfect Christmas gift. Sit, back, relax and savor the idea that Christmas is done. Check. As if I did not have enough to do with tomatoes at this time of year, you have to go and post this temptation! Too funny, my co-op just had the exact same deal. Beyond excited over that price, I called my mother and we are splitting the 90. Now it is Vanilla time, so your post is perfectly timed! I get my beans today! So happy to meet you and another sister in Christ! Wondering if you know how to make the extract without the alcohol? My husband and I are allergic. Thanks! God bless you and your’s. Nice to meet you too :). Thanks for visiting the blog! You can also use food grade vegetable glycerine in place of the alcohol. It will sub out 1:1. Does it matter the brand,etc of Vodka used with this process? Your thoughts on this? Hey Marjorie, I don’t have a brand preference, but like to buy a mid-level bottle of vodka. So, not the most expensive, but also not the cheapest. I love this idea! Do you keep the vanilla beans in the bottle when you gift it? If not, what’s your advice on getting them out? Also, what is the shelf life of the vanilla extract? Thank you for the idea and all of the wonderful content on your website! Hey Trisha, I leave the little floating bean pods and the long beans in the extract once it’s done. But, some people like to remove them by straining the extract through a cheesecloth or mesh strainer. The extract will last at least a year, and generally much longer. Enjoy! Hey Kathryn, There’s nothing that can go bad in vanilla extract (beans and vodka) and the alcohol helps preserve food, as well, so you’ll be just fine to use the vanilla. Kathryn, Sounds great! I think you’ll be very pleased. I just pulled out an “old” bottle of homemade vanilla and the color and smell were amazing!!! Thank you so much, Tierney :). I agree, finding information about “real food” alcohol (particularly hard liquor) is difficult. Real food vodka is usually made with potatoes, which at the moment aren’t genetically modified. I usually buy a middle-shelf vodka brand for making Christmas gifts from a local liquor store. Bourbon is an excellent choice for making homemade vanilla as it lends a very unique taste! As far as good organic or less additive vodkas, our local health food store carries a couple of different brands of vodka which I’ve bought for making homemade vanilla. I know, a health food store that sells vodka, lol. 100% Organic products can’t contain GMOs or artificial additives so that may be a good route to go. If you have a Trader Joe’s in your area, I’m told they also offer “real” vodka choices. Skyy brand is a great brand that is also sold at many conventional stores. Thank you so much, Londa. Welcome!! I don’t consume alcohol and I’m looking for a way to make alcoholfree vanilla extract at home. Every recipe seems to use vodka as it main ingredient to preserve the taste etc…. Hey Maryam, I’ve heard of some readers using food-grade glycerin or a combination of glycerin and water (I would be afraid of bacteria growth in the water) as substitute for the vodka . I can’t believe it took me so long to start making my own vanilla extract! I was first inspired when I bought and read; The Homemade Pantry:101 Foods to Stop Buying and Start Making, but this post gave me the nerve to actually try it. I guess I was afraid of using it in frosting for my kids, which is silly I know because the store bought kind is made the same way. Now that I’ll never go back to store bought vanilla extract, I am curious about other extracts. It looks like you have some peppermint extract going in the background there too, can you advise how much fresh peppermint leaves to use, and have you tried making any other extracts? I wanted to comment that if you use warm vodka, it will be ready in a week. I’ve been making vanilla extract from a recipe I found in Cook’s Illustrated, as I am a baker and use a lot of v. extract, and i don’t need to plan so far in advance. Once it’s ready, the longer it stands, the better. And it keeps indefinitely. When I make a new batch, I just add the new beans to the old beans. I sometimes add some of the old beans to some sugar to make delicious vanilla sugar. That’s awesome, Anat! Thank you so much for sharing. I can’t wait to try this method. What a fantastic gift, Monika! 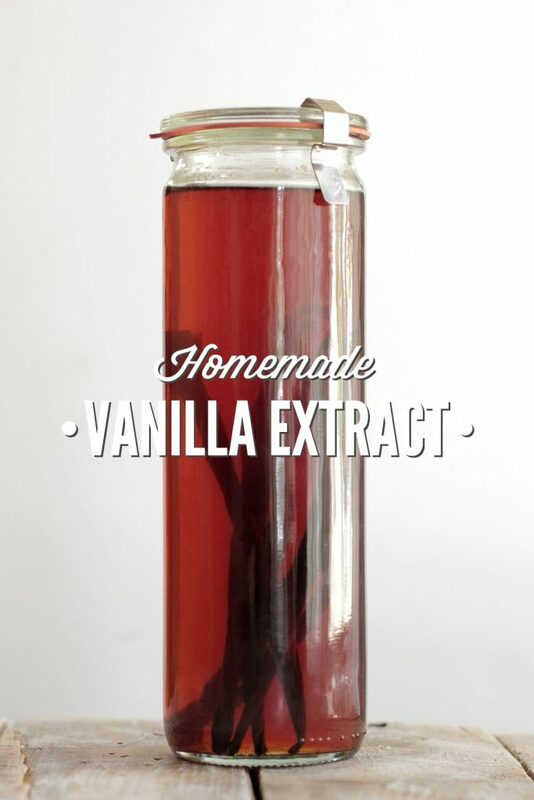 Enjoy making the vanilla extract :). The beans look whole, do you just slice and not split all the way? Hey Trisia, I slice the beans in half all the way, and then add them to the vodka. I think the photos may not do the actual slicing part justice ;). I’m loving your site! Protein granola bars, real eating on vacation now homemade vanilla extract?? It’s January but I’ve already set a reminder for June to start sourcing vanilla beans so I can make this for Christmas. What a wonderful idea!! That’s awesome, Diana! I’m so glad you’re enjoying the blog! I’ve been told the same beans could possibly be re-used for an additional batch. Have you tried this at all? Currently I can’t find beans under $5/bean, making this less cost-efficient, unless using them twice. Any other thoughts on where to purchase? Thanks! The link that u originally posted is selling the beans through a very expensive third party, do u know what other place sells beans at a decent price? Also have u ever tried Brandi instead of vodka, I’m reading that’s supposedly makes amazing vanilla extract. Thanks for sharing, this is a great idea! 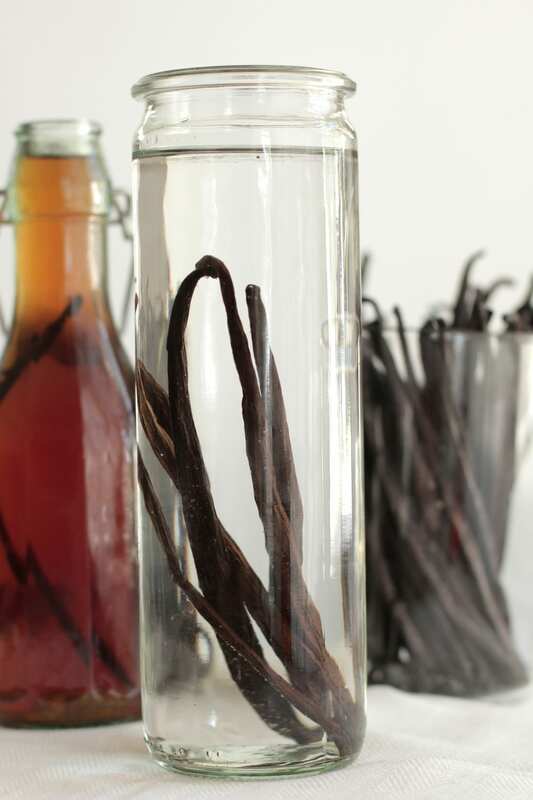 What is the shelf life of the vanilla extract?